Ninety minutes of fabulous Lindy Hop and Jitterbug dancing along with absolutely great jazz music. 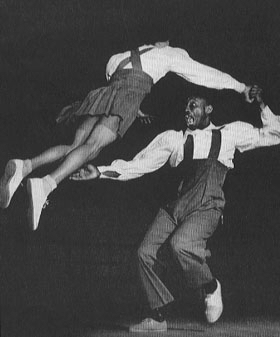 There have been periodic revivals of Lindy Hop dancing. One is going on right now. It is unbelievably fun to do. I will include a Lindy demonstration and lesson. 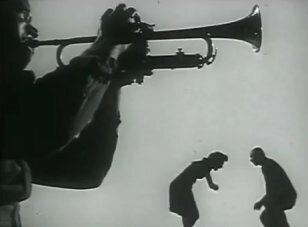 Jammin’ the Blues (1944) Considered by many the best jazz film ever made. It features the dancers Marie Bryant and Archie Savage. The musicians include Lester Young, Sweets Edison, Illinois Jacquet, Barney Kessel, Marlowe Morris, Jo Jones, Big Sid Catlett, and others. I Hear Music (1946) This is a Soundie of the great Burton Lane Frank Loesser song. The dancers are Grace MacDonald and Wesley Adams. College Dance scene from Start Cheering (1938) Excerpt features dancer Hal Le Roy and a bunch of popular dances of the thirties including the Big Apple and the Suzie Q as well as the Lindy Hop. Boardwalk Boogie 1941 The Will Bradley – Ray McKinley Orchestra could really Boogie. Check out their recording of Down the Road A Piece. The Youtube version is shorter than the film print I will show. Jerry Wald Orchestra from Swing the Western Way (1947) Excerpt. Jerry Wald was an excellent clarinet player. Good dancing too and great examples of 1940’s Pendleton Shirts. Will Osborne Orchestra 1942 The song is called Fantasia and features an extremely limber dancer. Boogie Upstairs 1943 Hard to say who these guys are. The piano player looks like Harry The Hipster Gibson. The Concertina Man 1942 Shenanigans and dancing in a park setting with a cop and a squeezebox player. Georgie Porgie 1941 This and other racy Soundies were marketed after the War in packages called Music With Spice. Jazz Dance (1954) This amazing film is of a night at a New York dance hall in 1954. It shows what a ball it was to Lindy Hop. Dancers Al Minns and Leon James are featured. The musicians are Jimmy McPartland, Willie “The Lion” Smith, Jimmie Archey, George Wettling, and Pee Wee Russel. Richard Leacock was a camera man on this. Finale of the feature Stormy Weather (1943) Amazing jazz and dancing with the Nicholas Brothers, Katherine Dunham Dancers, Bill Robinson, Cab Calloway, Lena Horne. It would nice if there was a Lindy Hop group in town to maybe have a dance after the show.